MAHLE Aftermarket Inc. has announced the “MAHLExKALITTA” social media promotion, featuring a grand prize trip for the winner and a guest to the NHRA Four-Wide Nationals taking place April 26-28 in Charlotte, North Carolina. The grand prize package includes round-trip flight, hotel accommodations, race tickets and VIP hospitality at the track. 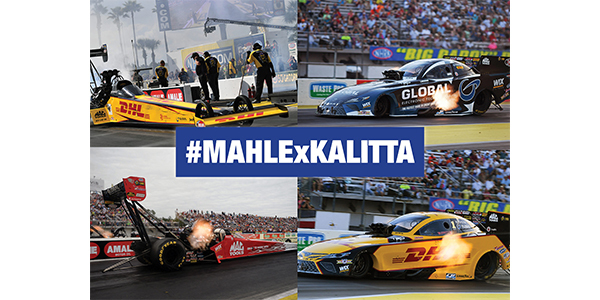 Ten additional winners will receive a MAHLE/Kalitta merchandise prize package. Contestants may enter by “Liking” and “Reposting” MAHLExKALITTA promotional videos and other promotional content that appears on MAHLE and Kalitta Motorsports social media channels, using the hashtag #MAHLExKALITTA. The deadline for entry is 11:59 p.m. EDT on Tuesday, April 16. The MAHLExKALITTA social media promotion is open to residents of the contiguous United States only. The grand prize winner and guest must be older than 18 years of age. Entries must be posted by 11:59 p.m. EDT on Tuesday, April 16. Winners will be selected and announced on April 17. For more information about MAHLE Aftermarket and its brands, visit mahle-aftermarket.com or contact your local sales representative.